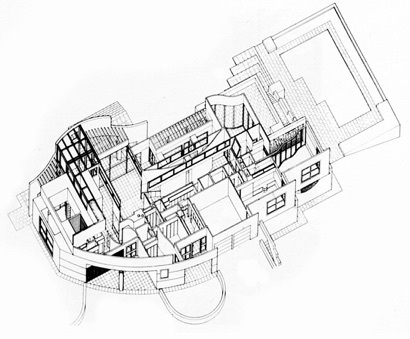 Plan and axonometric of the Ehrman House, Armonk, NY, Robert Stern and John Hagmann, 1974-6. 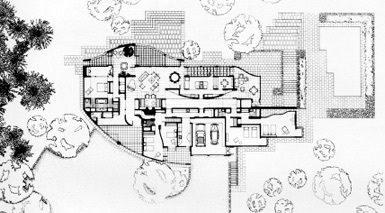 B1-a Plan and view of Robert Venturi’s Mother’s House, 1964. B1-e Plan by Jean-Nicolas-Louis Durand circa 1805. Initially, Post-modernism was chiefly concerned with alternate forms of the architectural object and its surfaces, as articulated in Robert Venturi’s 1966 book Complexity and Contradiction in Architecture. The meaning and style of building forms, shapes, and details constituted a search for an appropriate symbolism of the individual and the cultural problem of popular expression that had been redacted from Modern Architecture’s vocabulary. However, there was no real challenge to the underlying premise of modern space. 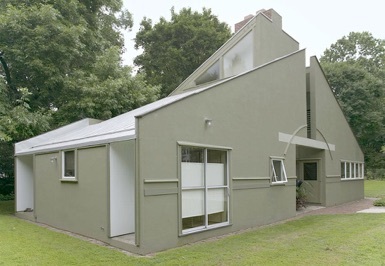 Robert Venturi’s inventive tour de force design for his Mother’s House (B1-a) in suburban Philadelphia combines a modernist formal structure of frontal layered planes reminiscent of Le Corbusier's Villa Garches with an appliqué of historically-referential pitched roof and ornament. The pedimented front with its large elevation openings suggests an arrangement of interior volumetric spaces. But the rooms remain incomplete, fragmented voids tied together by a curved wall of implied spatial continuity. This was a first step away from the free plan towards an architecture of volumetric space. Post-modernism assumed that Modern Architecture was worn out. It proposed new elements that referenced historical allusions as a substitute for the limited communicative devices of Modern Architecture’s abstract message of pure rationality. It was nostalgic for architectural ornament, espousing a return to exterior decoration and complexity following Venturi’s book with its advocacy of a knowledge of pre-modern formal history. 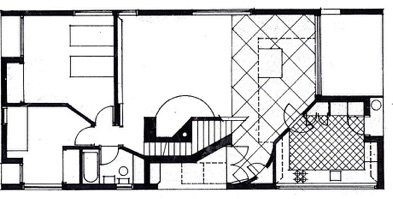 Ten years later, Robert Stern’s Ehrman House (B1-b) of 1976 uses highly decorative surfaces, but still depends on the modern premise of a flowing free plan of continuous space pushed to its limits. It is a dazzling display of free forms overlapping inside and out trying to break the bounds of pure modernist geometries. It is the last gasp of high modernism. The fragmented free plan of curving volumes resemble the multiple forms of a Braque Cubist painting. Which also prefigured the coming shapes of deconstruction. Post-modernism was essentially a revolt against Modern Architecture. It was a significant achievement. However, there was no recognition or challenge to the debilitating limits placed on architecture by the underlying context of Modernism’s continuous void of Anti-Space. It did not yet make new proposals for the external space of the city, nor did it offer a completely different kind of space for the interior. It was largely an American and suburban phenomenon reflecting a society of strong individualism. The Italian Neo-Rationalists of the 1960’s represented by Aldo Rossi’s seminal book The Architecture of the City published in Italy in 1966, (the same year as Venturi’s Contradiction..) were concerned with the opposite of an architecture of individual expression. Their concern was to reestablish the urban with a new monumental institutional architecture. Like the modernists, they focused, on a few general typological forms to be repeated on a giant scale. The intention was to represent a new ideological structure and meaning for a new kind of future reconstructed city. 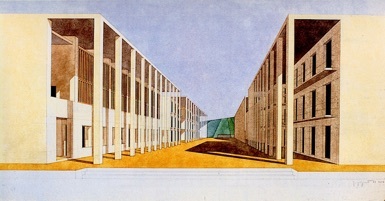 Like Modern Architecture, the Neo-rationalist Tendenza ignored the existing city fabric and presumed a tabula rasa would be necessary to make room for their new, rational autonomous architecture of elements, consisting of giant squares and grids of repeating parallel bars with occasional symbolic arcades. The formal architectural typology dominated all other considerations so that the same gridded monumental figures would serve any use, institutions, housing, dormitories, schools or cemeteries. 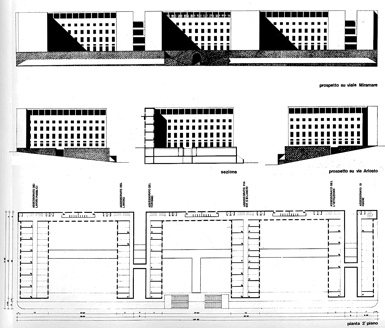 In the plans, elevations and site plan of Competition for Monza, Italy, (B1-c, d) by Aldo Rossi and Giorgio Grassi, 1966, exterior space was captured in the waffle-iron plan, but it is not really a new positive volumetric space. Rather, it is the inevitable leftover from the systematic rational geometric mega-building pattern. Outside the buildings, the surrounding emptiness remains a black hole of modernist, undefined Anti-Space with no alternative spatial ideas for interior space, which is a punitive and anonymous layout of repetitive cells. There is a clear nostalgia for the strict categorization of typological form deriving from the Enlightenment’s Neo-classicism, categorized in J.N.L. Durand’s Typologies of Institutional Monuments published in 1799 (B1-e). 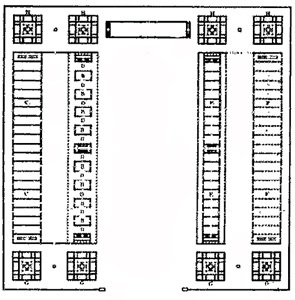 Compare the parallel building bars to the Chieti student housing project by Grassi, Monestrou, and Conti of 1974 (B1-f). Despite their general criticism of Modern Architecture, neither the classically-oriented Italian Neo-Rationalists nor the eclectic-oriented American Post-Modernists recognize the dilemma of Modern Space’s bland uniformity. Neither provides a clear critique or an explicit alternative to the underlying necessity of a continuous space. Like Modern Architecture itself, both groups remain object-fixated in their attempts to establish clear architectural symbols and icons. They tend to maintain the assumptions of Modern Space while seeking alternatives to Modern Architecture's more explicit and obvious rejection of meaning. Neither makes plans with a complex spatial focus, but concentrate instead on external appearance and literal symbol. The elevation, the bird's eye perspective, have become the generators as both movements indulge in a kind of historical mythology, returning to pre-modern architectural conditions and attitudes. It is as though each imagines that history can be rewritten to suit its own purposes. One starts with Ledoux and ends with an architecture for the worker, while the other begins with Lutyens and ends with an architecture for the consumer. They represent opposite poles of a similar investigation to discover anti-modern alternatives. Each aimed at revitalizing the meaning and symbolism of form; one slanted toward the collective memories within a collective order; the other toward the individual in a capitalist society. 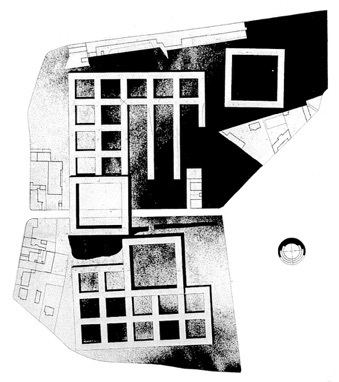 Site plan of Competition for Monza, Italy, by Aldo Rossi and Giorgio Grassi, done in 1966. The huge square grid of continuous architecture proposed In the site plan. Elevations and floor plan of Competition for Monza, Italy by Aldo Rossi and Giorgio Grassi, done in 1966. Neither position provides a solution for the complex spatial range which must exist between public requirements on the one hand and private needs on the other. No urban image emerges comparable to the sequence of movement through the namable spaces of a traditional city from the public Piazza, along the Avenue, down the Street, into the semi-public Courtyard, through the communal Foyer, up the Stairs and into the private Rooms. This is an elaborate sequence of passage through a rich typology of spaces for which there is a vocabulary of discrete terms. The complex linking of these provides an accommodation of the conflicting public and private domains, offering a place for the unpredictable and a location for intermediate transitions. 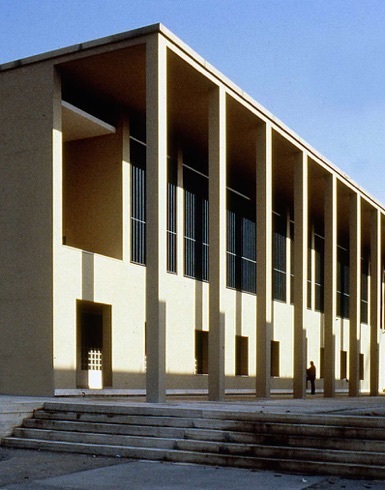 Contrary to these other movements of the 60’s and 70’s, Rob Krier and Leon Krier, formed a northern branch of a Rational Architecture which advocated a revival of an anti-modern typology, but it was a typology of volumetric spaces as opposed to a typology of object forms. Space was to be the primary positive figural ingredient required in the reconstruction of the city and its architecture. Rob Krier’s grid Typology of Urban Spaces of 1979 (B1-g) demonstrates the range, complexity and richness that is possible when a city is composed from the medium of figural space. It was a direct attack on the empty promise of Modernism’s insistence on a singular unmodified background uniformity. 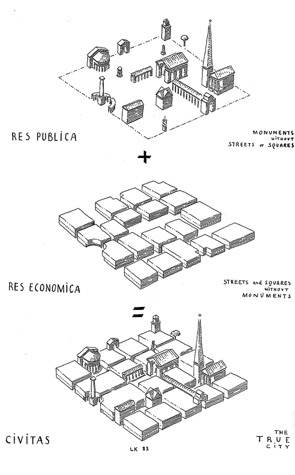 Leon Krier’s three analytical diagrams of the True City in Streets and Squares, Typological Order of Public Spaces of 1978 was composed of two essential constituent realms (B1-h). There is another realm undrawn, the third ingredient of public space. Space needs to be formed as a consciously constructed volume to make the city, because it is actually the joining element, that integrates and binds the objects of the Res Publica and the blocks of the Res Economica into a completed urban fabric of CIVITAS. Chieti student housing, Giorgio Grassi, Monestrou and Conti, 1974. B1-g Typology of Urban Spaces by Rob Krier, 1979. 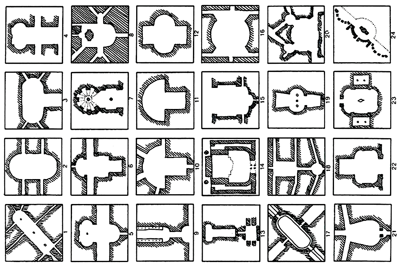 Streets and Squares, Typological Order of Public Spaces analysis by Leon Krier, 1978.